The 2018 BET Awards ceremony is officially underway, but we’re still reeling from all the standout fashion the celebs displayed on the red carpet in Los Angeles tonight. 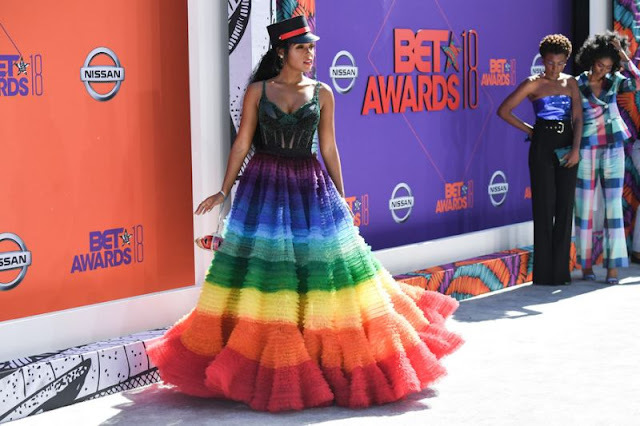 Janelle Monae, especially, made a statement in a rainbow gown that nods LGBTQ pride month. The “Dirty Computer” singer stepped out in a head-turning design featuring a dark green embroidered bodice and a full, ruffled skirt boasting every color in the rainbow. Monae accessorized with a coordinating miniature wristlet bag and topped things off with a black conductor-style hat with a red trim. Meanwhile, “A Wrinkle in Time” star Storm Reid wowed in a solar system-themed frock coming with a sheer purple top and an icy blue mid-length skirt. The 14-year-old’s dress was embroidered with stars, moons and planets, and accessorized with silver metallic sandals and triple hoop drop earrings. Elsewhere, Disney starlet Skai Jackson donned a cream-colored Pucci logo print turtleneck paired with a light-wash denim jacket boasting a vibrant embellished collar and an anti-guns pin, high-waisted shorts and silver metallic sandals. “Big Bank” rapper YG suited up in his signature color, red, and added an assortment of jewelry, a watch and a pair of classic white Nike Cortez kicks to his look. As for Meek Mill, white Vans with red flowers popped against black tuxedo pants, which he styled with a black bomber jacket and a white T-shirt reading “Freedom” in black letters, referring to his recent release from prison in April.